…but it can inspire a true consumer-centric content experience. Omnichannel is not a fad. It’s not some buzzword that replaces multichannel (although many people in the digital industry throw it around that way). 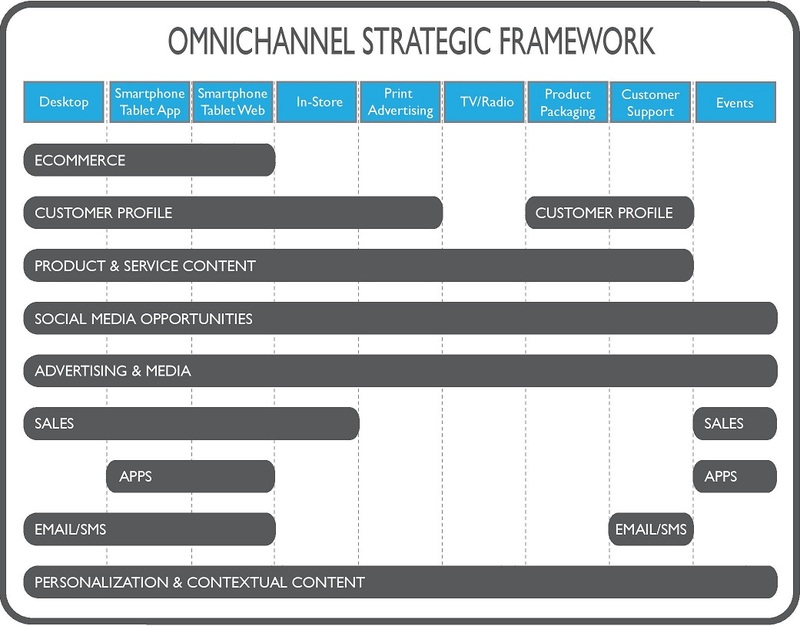 Omnichannel also does not have to consider every existing channel out there or all channels (Latin definitions of omni aside). It’s not something to throw up — no pun intended — and display as something that is the be-all, end-all solution for all things within multichannel publishing. Omnichannel presents a model for placing the consumer at the center of a brand experience. In contrast, multichannel considers more than one channel. There may be a strategy behind multichannel, but in its essence, the term means more than one channel. Omnichannel creates a cross-channel experience for a consumer so that he or she can complete relevant tasks with optimized content in each channel to complete the tasks. A solid omnichannel strategy starts with the consumer, his or her needs, and works backwards from those to establish which content, features and technology need to surface in which channels to support the consumer in that path. The consumer and his or her needs are at the center of the cross-channel experience. Here, I separate channels from functions within them (i.e., social media opportunities, email, etc). This approach sets up an infrastructure in a way to support cross-channel publishing. Many folks might argue that social media exists as a channel. Social media spans many publishing channels, all of which must account for its various nuances. Some channel-happy folks place media types (E.g., video, or sites that deliver it) as channels. These also do not a channel make, but rather content types, media, and/or format types that live within functions that live within channels. You can’t mix the concepts of platform and function if you want an effective and nimble content model to support multichannel publishing. OK, now that we got that out of the way. Let’s turn to omnichannel. I’ve said it before and will say it again, Martha Stewart is the mother of omnichannel. She named her company Martha Stewart Living Omnimedia for a reason. “Martha Stewart Living” captures her brand as an experience brand and “Omnimedia” conveys an all –encompassing media directive. She started with a cookbook, then grew a magazine to feature the perfect place-setting, then a television show that spoke to how to fold the perfect napkin and a desktop website to feature a do-it-yourself video that for cooking the perfect pie to place within that entire experience. Each channel, referred to content in the previous channels. Holistically, a story was told and the user received authentic, unique and optimized content regardless of which channel he or she was in. Notice in this example, how unique content in each channel supports the customer experience. Also notice how the customer lifecycle does not just end at the point of sale, but in fact, that is where the opportunity for it to flourish really starts. You can see from even this high-level journey that there are ample opportunities for different content experiences within the consumer journey! Unified ecommerce — tracks and supports purchase in all available channels. Personalization — creates intelligence around context of the consumer. I define this in both UX for Dummies and Enteprise Content Strategy: A Project Guide, and have for years positioned it as, as any contextual content targeted to a user based on: Who, What, How, Where, Why and/or When? Cross-channel metrics and engagement measurement — reviews analytics intra-channel as well as inter-channel. (E.g., measure what a consumer does in jumping from one channel to the next in addition to what she does within a singular channel such as a desktop website). Omnichannel does not present an easy solution. By in large it’s for retail, although it’s expanding to be beyond that. Businesses must make an investment to support omnichannel. Omnichannel requires a refactoring of how many businesses function, because internal business silos are challenged. If you start with the consumer, then work backwards from the channel, then determine which content is necessary to support it, you effectively look at the channel last. (Mobile-first—which actually means mobile (tablet) only–WTF??? Don’t worry, it’s a later blog post.) Businesses that have built their operations around channels (E.g., a line of business is incentivized by how much it sells online whereas another by how much it sells instore) must refactor their internal goals, objectives and operations to support omnichannel. Also businesses that that treat mobile websites and desktop websites equally and create a design that only considers a mobile solution must start to think about those as separate channels. Omnichannel also has considerable implications for internal publishing and how systems are set up and integrated to support omnichannel. Setting up a content publishing model around customer need and journey can prove revolutionary. Omnichannel is not going away. LCP Consulting’s latest report, The Omni-Channel Dilemma shows how businesses are grappling with the challenges omnichannel poses. You also don’t need to be a huge business to benefit from lessons that an omnichannel strategy can teach. You can design your consumer journeys around cross channel experiences to figure out which content is most necessary where. You can use metrics that track and measure that performance. You can set up a repeatable, closed-loop, performance-driven framework to evolve and grow your content experience. And maybe, if you do it right, you too can have a story similar to Martha’s and her Martha Stewart Living Omnimedia empire. Want to learn more? Read my book Enterprise Content Strategy: A Project Guide or UX for Dummies, or see Rebecca Schneider’s and my website: omnichannelcontentstrategy.com.